InsideOut Solutions is proud to announce the launch of two new custom responsive websites for bed and breakfast associations. StayVA, the Bed and Breakfast Association of Virginia and Bed & Breakfast Inns of Missouri (BBIM). 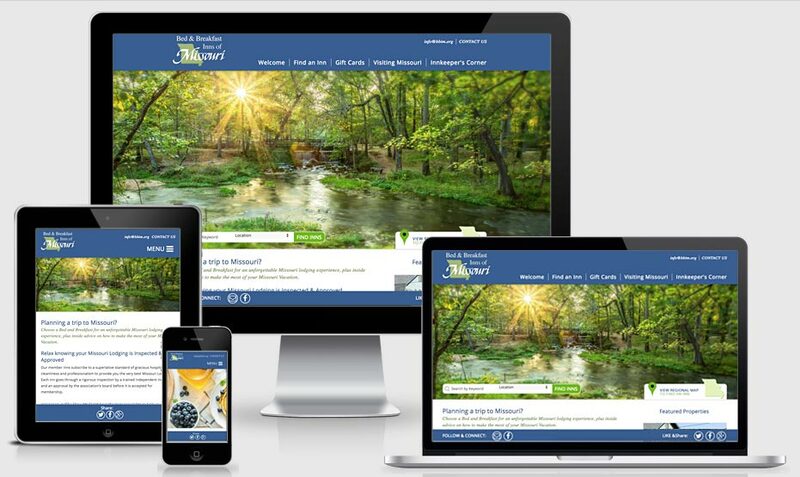 InsideOut Solutions has a long history of creating and hosting beautiful B&B association websites. We’ve designed and redesigned more than 50 directory sites over the years and understand what it takes. More often than not, directory websites that come to us either have good functionality and poor design or vice versa. A beautiful website does you no good if no one can find you in the search engines. Conversely, a website with an ugly or poorly designed interface can show up in the search engines as much as it wants – visitors will still navigate away, unconvinced. At InsideOut Solutions, we value both form AND function and work hard to make sure your website has the proper balance of both. The new StayVA website launched on February 26th, 2018. The Bed and Breakfast Association of Virginia had worked with us before and returned in 2017 after a few years exploring other options. 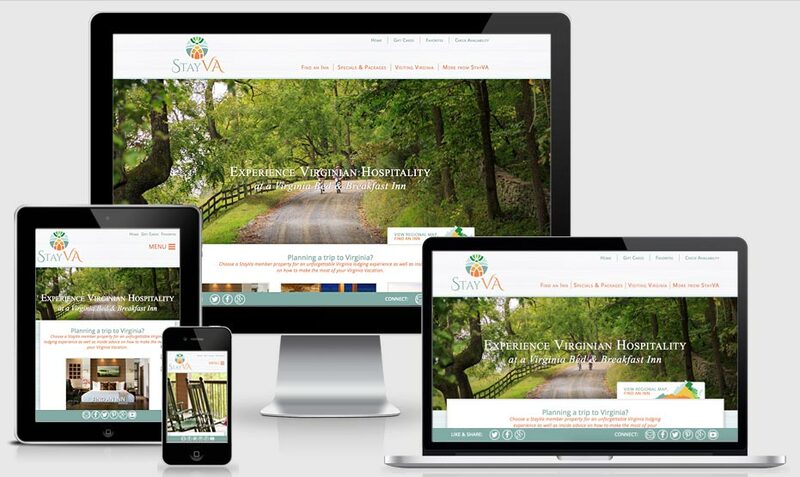 When StayVA came to us, their design was fine but their SEO was tanking, with minimal search engine visibility. Having worked with us before, they knew we could help. BEFORE: Bed & Breakfast Inns of Missouri’s old site needed an update. 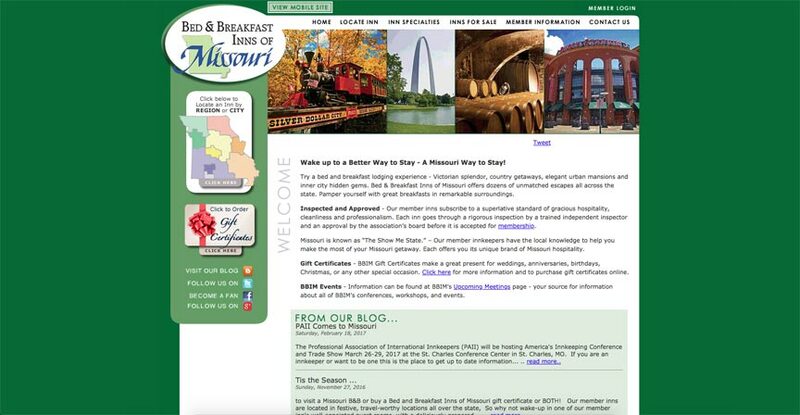 In the case of Bed & Breakfast Inns of Missouri, their current site had plenty of great content but was in desperate need of a updated design. It looked dated, messy, and wasn’t responsive. BBIM came to InsideOut Solutions because they’d seen and heard about our track record with directory sites. BBIM’s new site launched March 1st, 2018. In both instances, associations representatives worked with Lead Web Designer, Beth Edwards to create to craft a new look and feel. Once the design was nailed down, the projects were handed off to Web Development Lead, Jack Waknitz. Both responsive websites were developed in Laravel, an open-source PHP web framework. InsideOut Solutions uses Laravel over WordPress for our custom directory sites because of its highly efficient data and resources management. Directory websites are typically far larger than most other sites. Though we use WordPress for all our other sites, we required something more robust to handle all that data efficiently. WordPress or Laravel, with InsideOut Solutions the result is a cutting edge website and content management system that is easy for association board, staff, and members to use. A free training session shortly after each launch helped to make sure that this was true for all involved. Thinking of getting a new website design or website upgrade to your existing site? View our Website Design Portfolio and contact us today for a quote to improve your website’s marketing effectiveness.